Billed as "Robin Hood - the legend begins anew," Hood gives re-birth to the Robin Hood of lore in a new time and a new place. Rather than keeping to the assumed boundaries of the Old English tales, Lawhead explores what he (as he explains in the afterword, titled "Robin Hood in Wales?") believes could be the true origins of the legendary thief and his band of merry men. It takes place earlier than Richard and his crusades (from 1080 to 1100 AD - Richard wasn't king until 1189...sorry, Sean Connery - no cameo in this one! ), and a hundred or so miles to the South West of present-day Nottingham, in Wales. 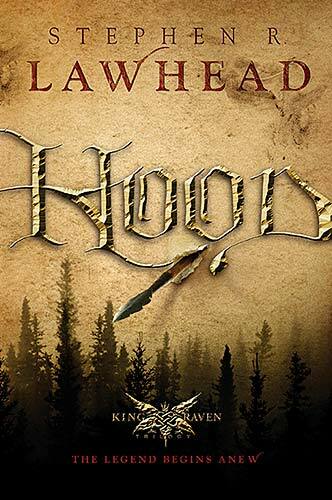 The change of time and of place lends a more mystical feel to the story; Lawhead employs a religion within the tale that seems a strangely cohesive mixture of Christianity, Paganism, Celtic lore and Magic. In addition, the language of the place and time works in two ways - first, it establishes that place and time, and second it acts as a device for Lawhead to provide explanations for that place and time. For example, Bran ap Brychan (the main character) is called Rhi Bran by his people - the word Rhi is the word for King and Bran translates to Raven so, literally King Raven, but given the language barrier between the Welsh natives and their Ffrenic conquerors, you can see how Rhi Bran could end up as "Robin" just as the new bishop confuses "Hud" (meaning male witch/warlock/sorcerer person) for "Hood." This volume, being the first in the King Raven ¹ trilogy, is mostly expository. it establishes the hero, his troupe, and a variety of villainous characters who oppose them, each one seemingly worse than the one before. Exposition in fiction (especially in a series) can sometimes come across as forced. But here (where there is a certain amount of information to be expected, given the legend) that doesn't happen so much. For example, while Bran's growth from profligate youth to warrior king of the forest is vividly akin to that of Edmund Dantès in The Count of Monte Cristo, the revelation that Iwan would, henceforth, be "Little John" and, on the same page, that Friar Aethelfrith would be Friar Tuck seems somewhat rushed and forced, and a little predictable. But the groundwork is deftly laid, and hopefully the next two books focus more on the real conflict than on the basics ².
Lawhead is a seasoned writer with an admirable talent for storytelling, and I look forward to seeing what lies ahead now that we've gone from what is to be expected of the legend, to what he will provide in his version. Hopefully it is filled with likeable characters and villains complex enough to be both hated and appreciated. Okay, so they're probably not Alan Rickman but then, I guess, who is ³? Actually, when I first got the books I thought they were the “Raven King” trilogy (latent dyslexia?) which is actually a different legend, care of Susanna Clarke’s Jonathan Strange & Mr. Norrell. But I wasn’t thinking about Clarke’s story. When I “read” “Raven King” the story I thought of was that of the Erl King (something completely different) which I initially relate with a YA book based on the Buffy the Vampire Slayer series called Childe of the Hunt wherein Buffy (& Co.) befriend Roland, the Erl King’s runaway son, who later becomes the new Erl King. This has loose ties to the Erl King from one of John Connolly’s stories in Nocturnes which is really creepy and not as friendly as the Buffy version…not that that version was particularly friendly…I seem to remember someone getting gored by the Erl King’s horns. Ah….what was I saying? Oh, right. I thought that the Erl King was the Raven King…though what the Erl King (or the Raven King) would have to do with Robin Hood, I haven’t a clue. I mean, in “Robin Hood: Prince of Thieves” it was easy. Kevin Costner comes back from the Crusades to find that his father’s been killed by the Sheriff of Nottingham and some other guys. The audience knows this before Kevin Costner does (ooh dramatic irony) because the second scene of the film (after the one where he escapes and saves Morgan Freeman) shows Brian Blessed (aka Papa Locksley) being given an ultimatum and then killed by Alan Rickman and some other dudes in masks and KKK garb, whose motives are never fully explained in the original theatrical release (the uncut DVD does a slightly better job). Anyway, the basics are established all in about the first 20 minutes of the film (all of the main characters with one exception have been introduced by that point, motives confirmed, and the path of revenge already well-trod.